Emma is still guest hosting the Crafty Photo Scavenger Hunt. Have a squizz at her blog to see the other entries this month. 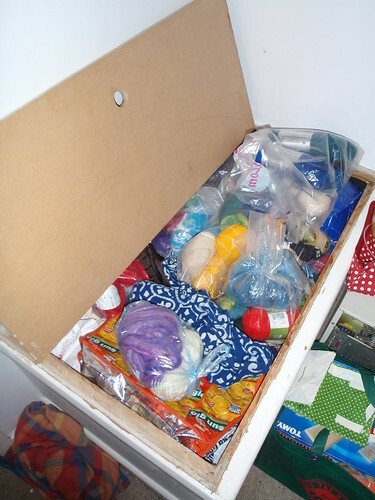 This is my stash cupboard. It represents just under half of my stash, I type, shamefacedly. However, it has been my inspiration this month: I've quite enjoyed going upstairs, opening it up and rummaging around for something new to knit. A lot of the yarn is bagged up with a project in mind, so it keeps me from having to think too hard about what to knit. Perfect for this time of year. Looking a bit sorry for itself after two days of wear, and covered in fuzz from the Christmassy hats I was knitting, this was my last minute attempt at a Christmas jumper for the end of term. 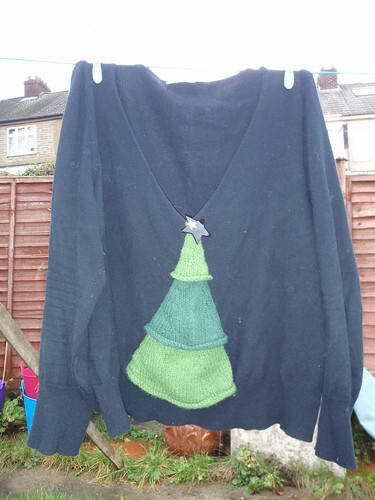 I loosely stitched a Yule tree onto the front of a plain jumper from New Look and decorated it with a star brooch. I thought the result was pretty tasteful for a Christmas jumper. 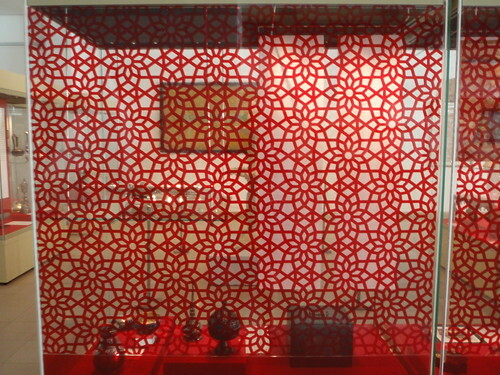 Nobody does Geometric like the Malaysians. 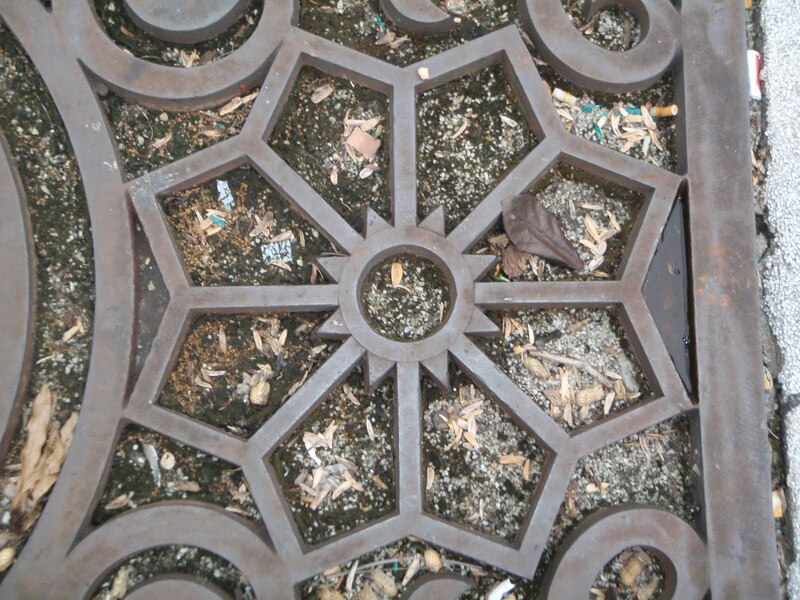 Even the drain covers are beautiful. I think I've put pictures of this bush up before but I am so grateful for it in December. 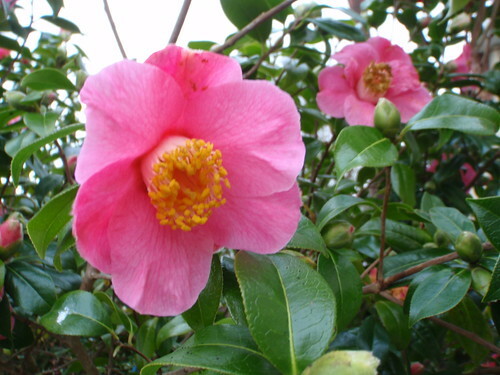 I'm a terrible gardener but this camellia has survived all my neglect and every winter blooms with these bright pink flowers just as it gets coldest. It is best viewed from the kitchen window and makes the washing up that little bit more palatable. 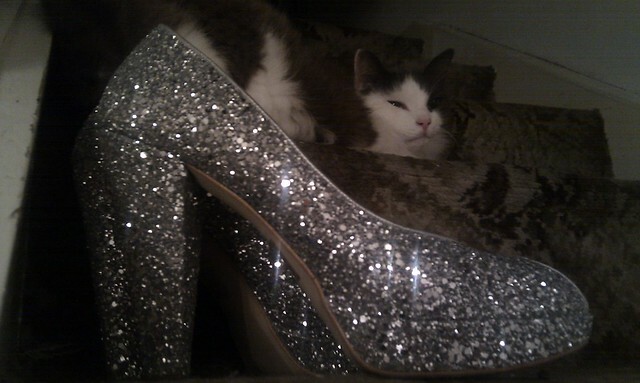 Not the obvious, but when the mitten curled up on the stair above my latest pair of beautiful shoes, it was a lovely sparkly picture of two of my favourite things, and made me feel quite full of the joys of the season. An outstandingly successful month in terms of goals! Especially considering it's December. Knit hats for Mother Hand and Sib's girlfriend for Christmas. Done! And I blogged about them here and here. Write and post at least ten Christmas cards. Done. I bought some beautiful cards from the Natural History Museum, with pictures from the Nature Photographer of the Year exhibition, and wrote them on the coach home. Win! Have all marking up to date by the end of term. Done. It may have given me neck ache, but definitely done. Plan 75% of lessons for the first week back after Christmas. By the end of term, I'd planned 10 out of 16 lessons, which left only the sixth form lessons. I thought this was good enough, in spite of it not being quite 75%. Of the six lessons left, I can double up two, which improves my score to 10/14. I'll take that. Do my tax return for 2010/11. This is always a Boxing Day job but I may have to do it a bit earlier this year. As of December 22nd, this was basically the last thing on this list I had left to do (not including short turns but I'm quietly confident about those) - so I was motivated to complete it a full four days early. 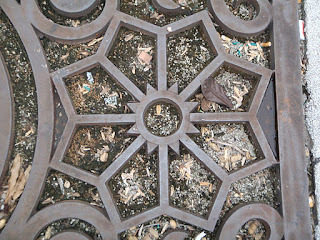 And motivated to keep my documents better organised for next year, and complete my tax return earlier, in say, April. And not make a mistake on it. I think I might have made a small mistake. Not as big as last year's mistake, when I missed a decimal point and briefly owed more than £3 million in tax, but a mistake nevertheless. Take five new ideas from the Google Teacher meet up in London I'm going to and blog about them on my work blog. 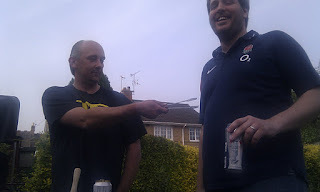 Didn't come away with five ideas - it wasn't that sort of event - but I did blog about it. Get very drunk at least twice. I seem to avoid drunkeness these days but I think it's good to cut loose now and again. Really crack short turns when I'm skiing in three weeks. Since I am currently away doing this (the joys of post scheduling) I can't say with all certainty that I have achieved this. But I am very hopeful that I will have. It's been a manic year of travelling. My passport is well-thumbed, and my little car racking up its mileage. I managed seven trips out of the country this year; three of those were thanks to work so I have not done too badly at all! I think seven foreign trips might be a little excessive, though. It adds up to a little over two months. I wonder if I could claim back some council tax for that? Pittsburgh - road trip to see Lisa, for the first time in 10 years! Can't believe I don't have any pictures of this. London - exam board meeting. Yawn. But I got to meet Kerrie's new baby and see Sib's new flat. Cardiff - Conference I organised for eight schools at the university. Australia - THE holiday of 2011. Australia - still! Well, I did go for a month. 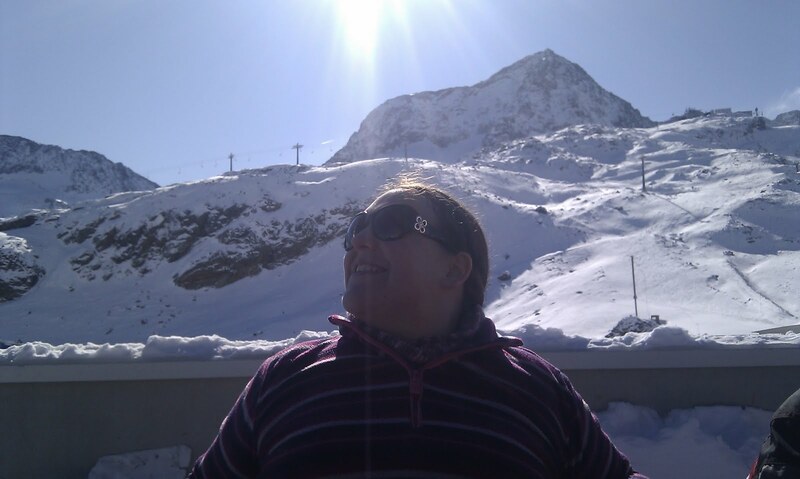 Austria - Stubai, via Munich - ASCL course. Redditch - finally did my grandaughter duty! And said goodbye to Sian who has now moved to Australia. 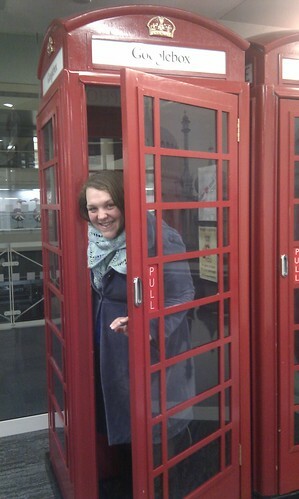 Two day trips to London: one for the Natural History Museum, one for the Google thing. France - Briancon - personal ski trip. Expect lots of pictures in the new year! I realised, when I looked at Flickr, that I haven't been diligent in uploading my pictures there this year, so I am rectifying that. My 2011 collection is here, if you want to look at more pictures! Thank you for reading my blog. In November I had the most number of monthly readers ever, which was quite nice. I do wonder who on earth finds this stuff interesting, since I still seem to be writing this blog merely to amuse myself - but I do appreciate you for popping over and partaking of my ramblings. I hope you have a lovely Christmas and a very merry New Year. Mods: I thought I knew better, this time around, and added an extra stitch in the garter edge on the right hand edge to stop the brim edge from curling. 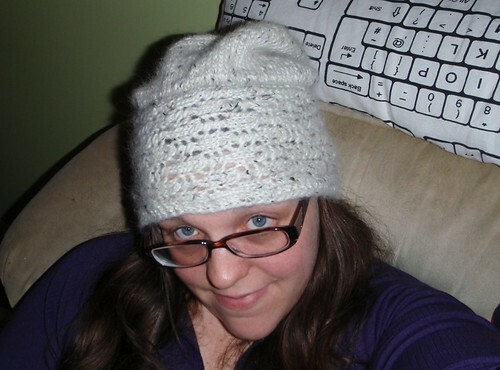 Turns out I hadn't thought it through properly, and I should have added it on the left hand edge; so when I was time to pick up stitches for the crown I had to do it opposite to the pattern, which meant I had to knit an extra row before I did the increases (I purled it instead of knitting so my hat had a solely stockinette crown), and the button flap is on the opposite side. But it was OK. 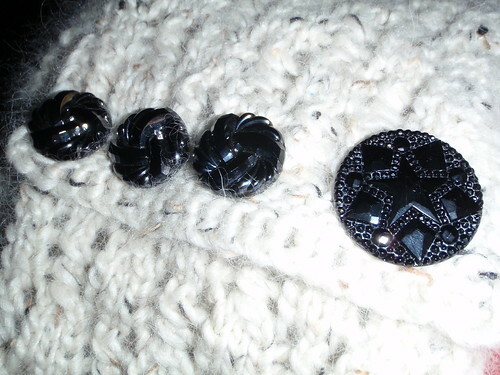 I put it with three grey-black glass buttons I scavenged from Gill, who comes to the Get Knitted knitting group and is unfailingly generous with her buttons and brought in the entire collection for us to rummage through a few months ago. I really love this hat. Like, really. Like, so much, it has bumped the double-pointed Santa hat for the last few days before Christmas, which is kind of sad really because the Santa hat can't be worn any other time of year. So much, that I got it cast on and finished in less than 48 hours. Just have to make sure I don't wear it when I'm around Elise. 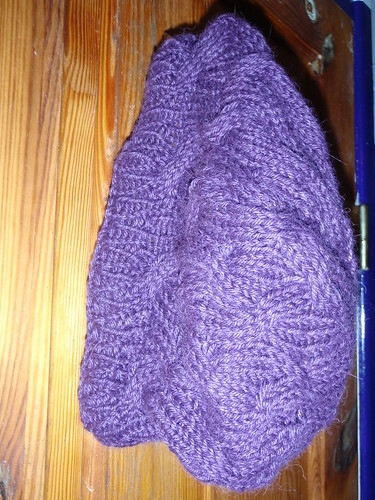 When I went up to look at my stash this jumped out at me for my friend's Christmas present, so I knit her a headband with it. It's the same basic pattern as this one but I decreased towards the crown so that it bows inwards a bit, more like a hat. Quite pleased with how it turned out. Emma picked this week's word. Please pop over to see her post, especially about her inspiration by post project (which I would love to take part in next year! ), and read everybody else's. I like getting nice mail, and I like sending it too. I have a stash of nice cards which I break out when I have a little spare time, which isn't often enough to warrant the amount of cards I buy. I guess they fall into that stationery bracket and are therefore irresistible to me. My love of nice things in the post is probably what keeps me signing up for the secret swaps on my favourite forum. I've been doing these for years, but their current incarnation is secret friends, which lasts a year and involves three pieces of post and endless stalking. I love coming home to a surprise gift at a random moment, and this year my secret friend has had a good line in cupcake cards with recipes on the back which I LOVE. Putting the parcels together is really fun, too. I particularly like getting magazines in the post. I subscribe to a knitting magazine and a History teacher magazine and I love it when they arrive, because flicking through them fills the hour or two between getting home and eating dinner. I think I might start subscribing to one or two more next year. We get quite a lot of junk mail and it would be nice to have more good stuff in there. This is my 22nd Weekword post for this year, and I've really enjoyed learning some new words and reading some new blogs, as a result of participating. I hope we can continue our little word-picking circle in the new year - have a great holiday season, everyone! Mods: None. Except, I didn't sew on a row of buttons. 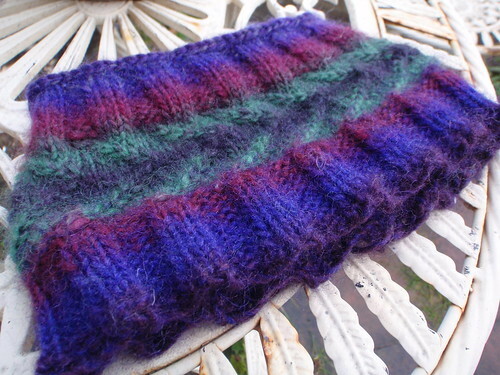 I treated Elise to three buttons from my Swarovski crystal set, which hopefully made up for the fact that I bought Sib a Kindle whilst she, his girlfriend of two years, got a hand knitted accessory. She is dark-haired and pale with very lovely dark eyes and I thought the contrast of the buttons on the yarn would suit her, which I think it did. I loved this hat a lot. 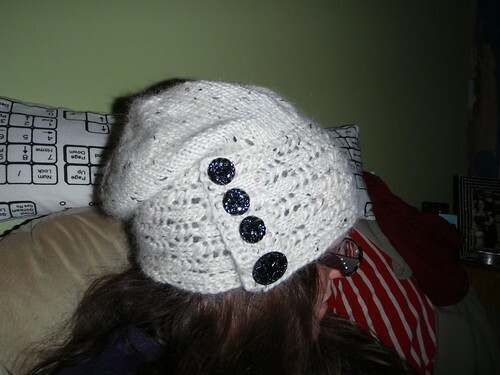 If I hadn't finished it 30 minutes before she arrived, I might have kept it for myself and knitted her something else. But there. 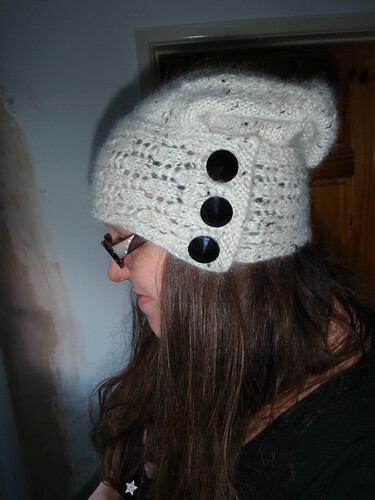 I think I have another skein of this, I can always make myself one. 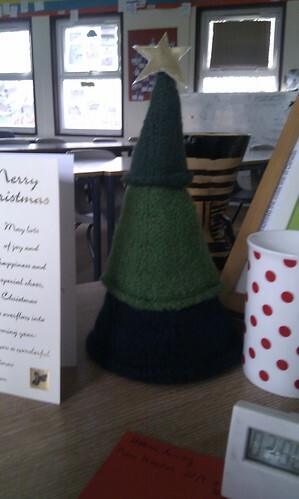 I felted my Yule Trees last weekend. One went out in a secret swap, one went to Mr Z's work and the other is on my desk at work. I cut a semi-circle out of some card I no longer needed and stapled it together to stabilise the base. And then I coloured in that star myself and attached it to the top with some sellotape. I like it a lot! Next year, when we have a decorated lounge that we can put Christmas decorations up in, I hope to have a small forest of them. I certainly bought enough green cascade for a forest. I am also quite pleased that the medium sized trees came out at a very nice size, because I don't know if I could face knitting the biggest ones. This time of year, my thoughts turn to survival. I feel like I'm one side of a war of attrition and my single focus is not allowing myself to be ground into the mud that threatens to envelope my classroom, and not giving in and just going to sleep as soon as I get home from work. So my goals are going to be quite focused on things to help me with this! Plan 75% of lessons for the first week back after Christmas - we arrive back from skiing on an 8pm flight on Monday, and term starts on Tuesday, and although it should be an inset day, it's now been changed. So straight back to the chalkface and the only way I won't feel like it's a whole new attrition war is if I plan it before I leave! Really crack short turns when I'm skiing in three weeks. Assuming there is actually some snow by then. Crossing everything. 1. A red Dualit handwhisk. Mother Hand's getting me this. My old handwhisk was a gift from my grandparents for my 18th birthday, so it has lasted well but it's time to put it out to pasture, with easy things like egg whites and cream. 2. Scrabble cushions. They will go beautifully in our newly decorated lounge. Sib is in charge of purchasing these. 3. In fact, almost anything from Literary Gifts. I like this, these (would be so amazing for school!) and these which made me squeak OMGSCRABBLEONTHEFRIDGE when I saw them, in a voice only dogs could hear. 4. Some more of this yarn. There was a pattern for a whole cardigan knitted from it in one of the summer Vogue Knittings, and although I think such a thing preposterous, given the cost of the yarn, I am hankering after it a little. 5. A hypoallergenic pillow. I'm so tired of wishing I could take my sinuses out, rinse them and put them back in. Itchy, tickly nose, begone. 6. Amazon gift vouchers. I seem to buy basically all my music and books from Amazon these days, and some credit with them would go down a treat, particularly since you can't buy Kindle books as gifts at the moment. 7. Some of this Neals Yard moisturiser. They gave away free samples with a magazine, which were passed on to me by Parpy Jo, and I have become a fan. Feel a bit guilty because I still love Lush skincare, and their Gorgeous moisturiser is still my favourite, but since they discontinued my all-time number one facial product, I am making sure I have some alternatives available. 8. Some thermals. Funky ones. Something I can wear for skiing and also around the house. I can't find any I like online. 9. A big bottle of Moroccanoil. This product allows me to leave my hair to dry naturally, without putting up with stupid frizziness. Ergo, it is a much cheaper version of a Brazilian Blowdry. Emma at the Gift Shed picked this week's word, novel. A fitting word for the end of NaNoWriMo! I am always tempted by NaNoWriMo, but I know my limits. I remember the first year I picked applicants for the Malaysia trip, and I was super-impressed that one of the girls had completed the challenge, in her GCSE year no less. I questioned her about it during the trip and she recommended a great tool to use when you want to write but are distracted by other things. It's called Write Or Die. If you stop typing for a certain length of time it starts eating your words! I note it is now available as an app, too. Once I was writing a novel, back when I moved to Bristol and had very, very dull office temp work. I reckon I'd written about a fifth, and I had my whole plot outlined, but then I started teacher training and it all got a bit lost. I didn't have time and my own story had diverged completely from the character I was writing. I used to think the best novels were written by people writing semi-autobiographically but since I've started to favour historical novels, obviously that has changed. Now I think that good writers draw on their experiences but perhaps only in terms of an emotional reaction or a relationship dynamic, though these might appear differently through the lens of the story around it. I did always want to be a novelist, though. Perhaps there's still time. I love writing enough, and I have experiences a-plenty - time, as ever, is the only issue. 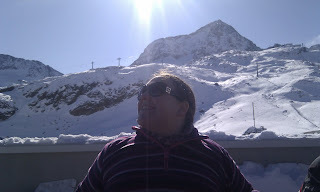 Please pop over to Emma's blog to read the other entries this week! Send out letters to parents that I usually send in term 1. Analyse the Y7 data and identify the key group for which I'm responsible. Not done - but, tbf, nobody has asked me for one. I have a feeling it may not be necessary this year, and anyway I have a mental development plan of the things I want to concentrate on at work this year. I can't believe it's almost a third over, though. Review and set performance management targets. Done. Eventually. I had to be a bit stroppy about it, but that's not a surprise. Distribute new technologies questionnaire to staff. Yes, and lots of people have responded - even more since I offered a prize draw for everybody who completed it. Try three new recipes from my baking book, one involving yeast. I tried two. I bought yeast and strong flour yesterday to make babas, but in the end I decided I didn't have enough time and I didn't want babas that much yesterday. Finish knitting Louzle's ski mask. I let it beat me! 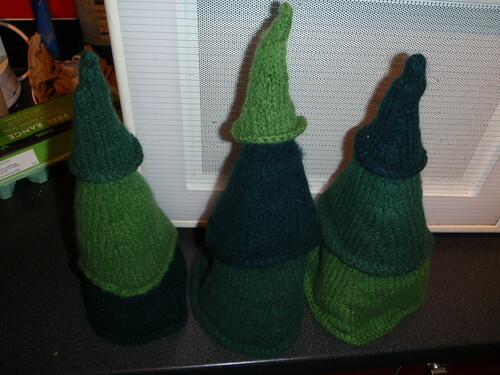 I am not enjoying the intarsia and so I put it aside and got on with the Christmas tree cones instead. Work methodically through the chapters of this text book I'm writing. It is all finished in terms of content. I'm wrestling with the syntax and the revision tasks now, but it's basically done, and the deadline was yesterday so that's good. I haven't sent any of it off yet, though. Well, I haven't had a contract yet. It feels a bit small to refuse to send anything until I get a contract, but it is also sensible behaviour. Yes, I read Dissolution and I'm part way through Dark Fire, both featuring a hunchback lawyer in the reign of Henry VIII, solving mysteries. Very enjoyable. I may go and read some more now, actually. Not a bad month! Maybe I made it too easy. It has felt like quite a busy month, though, and blogging every day has been quite a challenge. I noticed that I managed to, by complete coincidence, achieve 127 posts in both 2009 and 2010, so now I am focusing on achieving 127 posts in 2011 too. I reckon now I've only got 17 to go. Expect to see this on my monthly goals list for December.